Blowout preventer or BOP stack is the tool in the petroleum industry to prevent such a horrible event like blowout to occur. It consists of several large valves stacked on top of each other. Rigs usually have two type of BOP stack. The one on the top is an annular preventer, and below the annular preventer are ram preventers. Annular preventers or spherical preventer are able to seal around several size of drill pipe, drill collar, work string, wireline, tubing, etc. The annulaer preventer caonsists of a body, a cap, a piston and rubber packing element. 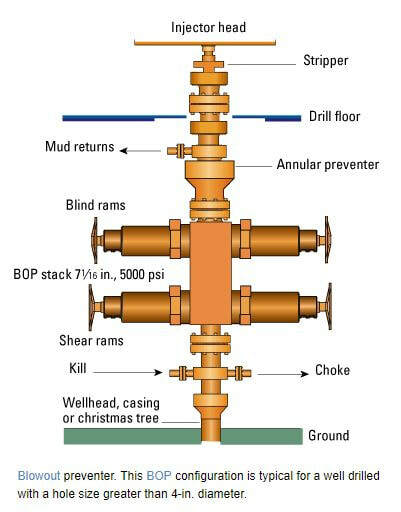 ​Ram preventer consists of two rams which extend into the center of the wellbore in order to shut the well in. the ram prevennter can be operated hydraulically or manually. There are four types of ram BOPs. It is designed to hold pressure from the bottom only by closing around the drill string or tubular in order to restrict the flow. It is similar to the pipe rams but it is able to utilize with a wider range of outside diameter of pipe. This rams are used to close the well bore when there is no drilling string in the wellbore, because they are not able to cut the pipe. It is similar to the blind ram, but it can cut the pipe prior to shutting the well.